Using a pool net and some raw meat, Sam Kanizay collected thousands of what looked like mites, each of them about 2 millimeters long. It wasn't until Sam Kanizay emerged from the water that he realized his feet were bleeding. Profusely. 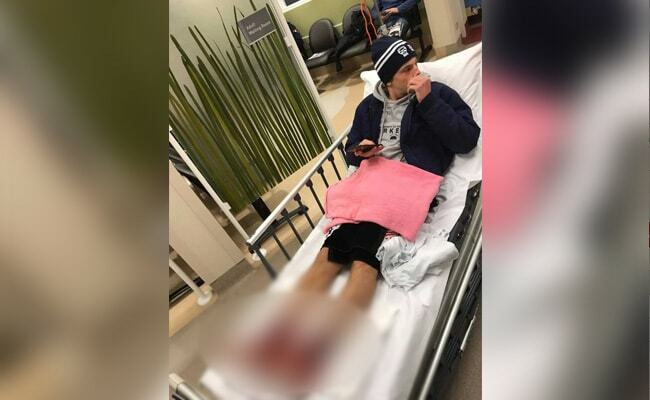 The bleeding was caused by lysianassid amphipods or "sea fleas"
When 16-year-old Sam Kanizay waded into the water off Brighton Beach late Saturday, it wasn't anything unusual for the Australian teen. He had grown up in that area of Melbourne, part of an active family that participated in triathlons and frequently swam in the ocean. His legs were sore from football practice earlier that day, so for about half an hour, he stood waist-deep in the dark and let the cold waters soothe his feet as he listened to music on his iPhone. It wasn't until he emerged from the water that he realized his feet were bleeding. Profusely. They discovered thousands of tiny bites on the teen's legs, almost as if he had been pricked with a pin repeatedly. There was also a massive amount of blood. "There was no stopping the bleeding," his father said. "We just had to get him to hospital." The chill of the water had apparently numbed Sam's feet enough to where he didn't feel any bites while he was standing in the bay. But on the way to the hospital, Sam told him that his pain was "up to an eight out of 10," his father said. He instructed his son to be honest with the nurses about the pain so he wouldn't have to wait long in the emergency room. They didn't have to worry; one look at his son's feet and the bloody "mess" they made and hospital staff admitted Sam right away, Kanizay said. Sam's injuries baffled doctors and nurses at first. They treated the bleeding and inspected his feet, but no one could say for certain what had caused his legs to look like those of a "Piranha 3D" extra. Kanizay, who said he has lived in the Brighton Beach area for 20 years, posted photos of his son's feet to Facebook and said it was a mystery to his neighbors and friends, as well. "I hadn't heard of this happening before, and neither had my friends or any of the medics," he said. "Since the story broke, there have been some people who have had minor bleeding and, therefore, they would go to just their local doctor." Kanizay returned to the bay and waded back to the same spot where Sam had stood - albeit with two wet suits on to protect his skin. Using a pool net and some raw meat, he collected thousands of what looked like mites, each of them about 2 millimeters long. "You know, nurses and doctors from the hospital weren't going to jump in and try to get these critters, right?" Kanizay said. "I thought that someone had to solve the puzzle as to what had eaten Sam's legs." Genefor Walker-Smith, a marine biologist at Museum Victoria in Melbourne, identified the creatures Kanizay had collected as lysianassid amphipods, minuscule scavenging crustaceans that are attracted to the chemicals emitted by decaying meat, the museum said in a statement. Sometimes referred to as "sea fleas," the amphipods will not cause lasting damage, she said. "They occur in swarms, so they'll swarm on a dead fish and eat it in next to no time," Walker-Smith told the Australian Broadcasting Corp.
She added that what happened with Sam was an "unlucky" occurrence and that other beachgoers shouldn't be afraid of similar attacks. "It's possible [Sam] disturbed a feeding group, but they are generally not out there waiting to attack like piranhas," she told the ABC. "The crustaceans would have swarmed off that piece of dead fish and onto his leg. He may have already had a cut, perhaps, and they were able to smell that wound or any chemicals that the wound was giving off." As for Sam, he is recovering. "He's certainly on the mend; we hope that he makes a full recovery," his father said. "He might come home with some scars. We're hoping not." Sam has no plans to avoid the water - though he may think twice before standing still in one place for so long, his father said. "He's a pretty calm kid. He was calm and collected," Kanizay said. "It's a bit of a red herring day. Stuff happens. This is just a really bizarre thing that happened to my son. We're comfortable with going back in the water and feeling safe in the water."